One of the first playdates we went to was quite memorable for me. Number 1 was little, maybe 12 months old. The boy was nice. The mom was nice but what I remember most were their toys. This family had the coolest toys and one of them were the Lauri Tall Stacker Pegs. I had never seen them before but as soon as they showed it to me, I immediately had to touch it. The rubber pegboard was nice and sturdy. The pegs fit perfectly on top of each other. The colors were of the general variety (red, blue, yellow, green, orange) but they were so bright. 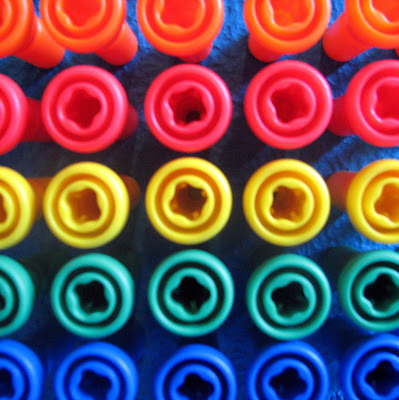 They sort of looked like what happiness would look like if happiness was made of pegs. 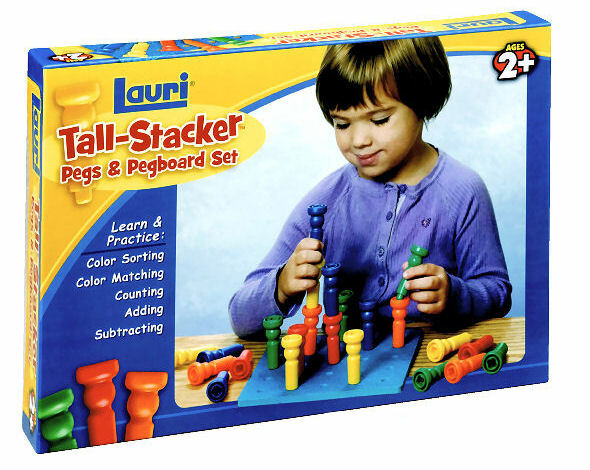 I had to buy those Lauri pegs but he was too young. Finally, by the time Number 1 Son was almost 2 years old, I got them! Thank goodness for school supply stores- I finally had figured out that school supply stores had A-list toys! (Carol's! You're the best!) If I didn't see them there, I would have probably had to go online. Number 1 Son played with them for a long time and then we put it away for our second child. Then as Number 2 Son approached his third birthday, we decided to give them away. He was done with it but here is one thing I learned about high-quality open-ended toys for the little ones. Even if your child hasn't touched them in three months, DO NOT GIVE THEM AWAY. Why? Well, if I told you that in six months, they would be able to do so much more with it, would you give them away? Especially if you had to pay for shipping for that toy? No way, right? But that is something I didn't quite understand about toys back then. Certain toys can grow with them as long as I know that they will be played with differently as my child grows. Three years ago, I had no such foresight. I was always re-sorting, re-categorizing the toy section at home. When toys stopped getting used, I would put them in an area that is somewhat akin to the pile of papers on your desk at the office that will never be read. Either that, or I'd just give away or sell them immediately. Three years after giving away my Lauri pegs, I met Emily Andrews, M.S.Ed., Preschool Director at the Quad Manhattan. Emily is one teacher who is very enthusiastic about her toys that are also her tools for helping children make new discoveries each time they play. One day, we happened to be talking about the Lauri Tall Stacker Pegs and she told me how she thought the pegs were great for preschoolers. Huh? But the box says "2+"! Surely, that means preschoolers who are 4 or 5 years old wouldn't enjoy them, right? But surely they would Emily told me. Of course I'm wrong. Preschool teachers know everything. They really do. My old boss, who bore the weight of public relations, marketing, and advertising for an internationally-recognized medical school and hospital used to be a preschool teacher too! Preschool teachers are very special and very smart humans. Basically, this is our story: When my kids were playing with it during their 2's, they pegged it together, sometimes made a long train-like thing, sometimes pegged it together to make it stack high, and that was about it. But after speaking with Emily, I understood that I was thinking about the Lauri pegs WITH limits rather than without. Quick!!!! 5 X 5 = WHAT? "They offer the children and teachers an open-ended math manipulative that doubles as a dramatic play prop," said Emily. Pegs are for dramatic play? Well, they never did that before. Oh man, I never ever regretted giving anything away. Usually the moment of pain is when you actually hand it over to someone but after it's gone, I've never looked back. But now, I feel like the jerk that didn't know I had it good until he was gone. "They are for certain, a multi-purpose item," said Emily. "Teachers can use them to tell a social story to the kids." Pegs as people? I can't remember the last time, I did that. I think I've only used people as people. I have even bought Asian people-looking dolls to be the people in my kids' toybox. I had to re-clothe the mom who was wearing a Chinese silk dress (because that annoyed me to no end) but you get the picture - I don't often use symbolic objects to represent people. However, Emily shows her preschool class how this kind of play is so natural and she told me, "they may try using pegs to make their own story." Emily also told me that they can become props, like a birthday cake in the dramatic play area. Again, I'm totally kicking myself that I gave mine away. Luckily, I caught a forgiving break. Lauri has very smart PR people who understand how toy reviewers can make huge mistakes. They sent us a box filled with these familiar friends and my kids started playing with them right away. As I watched my kids play, I started thinking about their younger years but it looks like they did not do any reminiscing at all. They just played with them, just like any other toy we bring home. First important thing to note: they did what Emily said they'd do. The pegs immediately became props. The best was "bus stop." Seriously, kids amaze me. Emily amazes me. 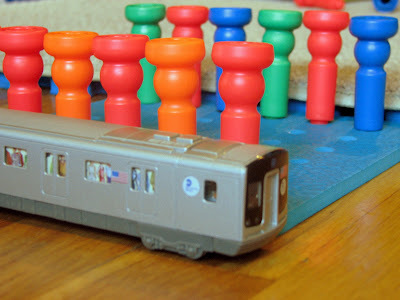 The pegs and the peg board make an excellent bus stop and train station too! Of course, it's a train station. I dig his patterns though..
"Some teachers like to put these out at arrival time as they offer kids an open ended hands-on opportunity right off the bat," Emily said. "Children are attracted to the multi-color pegs and the idea of 'filling up their board.' They like to decide if they will work on their own board, or work together to fill the board more quickly," Emily told me. Emily also said that sometimes children will push their boards together to create a bigger plain. They would name it, she said, "“this is an ocean” or “this is Central Park with so many people in it.” Emily hears new ideas from kids every year. "The ideas differ because they come from each child’s experiences, from their own lives." The skills involved here also include early literacy- that's right! You heard it here first, if you've never heard that before about Lauri Pegs! 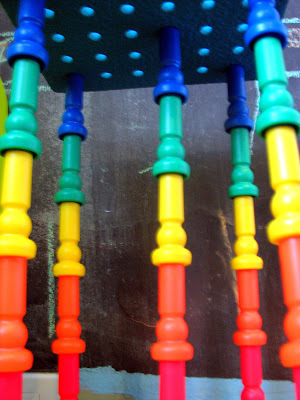 Emily shared that when a child is playing with something like pegs and a pegboard, to say that they are "planting seeds in the ground" is symbolic play. They no longer need actual seeds and soil to do imaginative gardening play. "This concept is at the heart of early literacy skills. It is the bedrock of reading." Emily said. 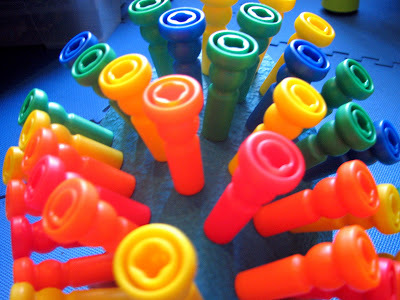 "The idea of representation is important because if a child can grasp that a colorful peg can represent a seed or a birthday candle, then they are getting closer to understanding the abstract idea that a letter symbol can represent a sound and that those sounds, strung together make a word." Oh, goodness gracious! I can't believe that I gave those pegs away! Could they have written a warning on the box somewhere? WARNING: If you give these away, prepare for minor self-loathing in twelve months. I learned how to turn the pegboard upside down from Number 1 Son, our family's captain of fun. Don't Forget Math and Language! Of course, Emily talked about how the pegs could be used to count. "Children can make patterns that go from side to side or that go up and down," she said referring to a stacking motion. 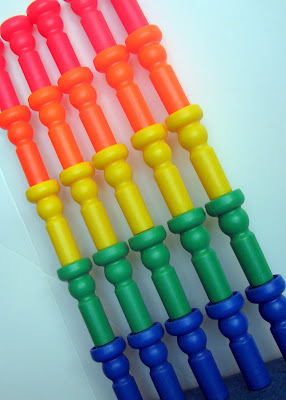 "The pegs can also be used for sorting or categorizing skills," added Emily who talked about how she's seen children use them to make a row of red, a row of green.... etc. Emily also said that sorting and counting on a peg board can also be used later in life for math as well. 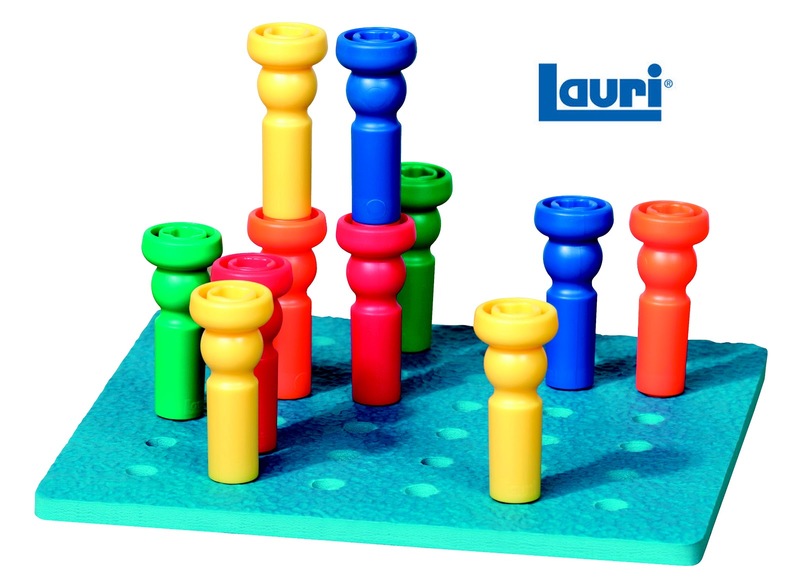 For example, you can use counted and uncounted pegs on a peg board. 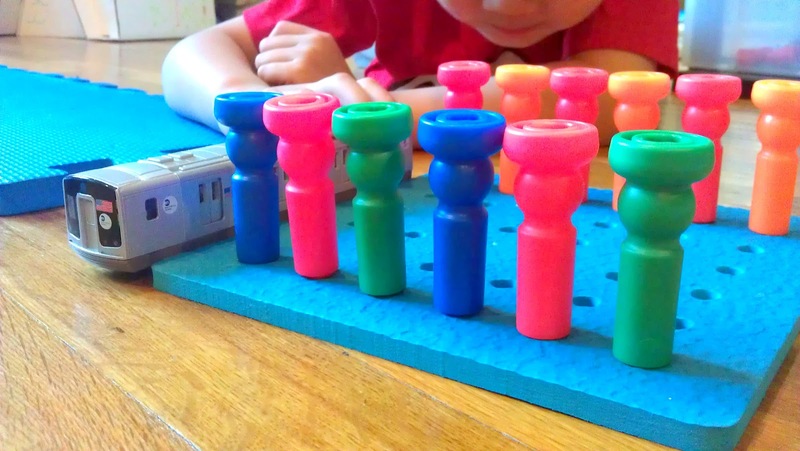 They may visualize or possibly even use the peg boards to do more substantial math in later years. Emily also uses the pegs to talk about size (short tower, tall tower, medium tower). "Also, they are a good visual representation when introducing terms of direction like in front of", "next to," "behind,"" Emily added. When the kids get older, she could even talk about terms such a diagonal. If you have a child that is older and if you had Lauri pegs, are you kicking yourself too right now or did you do all those great things Emily mentioned already? I confess, I sooooo did not. This realization was a little painful. But at least we have them back with us, back where they belong. There are slightly more than 25 pegs here but I just had to show you "The Mango." Come back tomorrow morning for some more peg talk if you can handle it! Emily, master teacher shares her ideas about how to play with them and I will tell you how about my TOP SECRET "toy growth formula." This toy is something you can really grow with! Have Prime and want to get it on Amazon fast? Try my link below! Disclosure statement: Toys are Tools has not been compensated in any fashion by the manufacturer or retailer of any of the mentioned products for the publication of this post. The product was given to Toys are Tools' testers and the expert to facilitate a review. Reviews are never promised.